Altadena Heritage and Altadena Historical Society, with generous assistance from Supervisor Michael Antonovich, would like to invite all Altadena civic institutions, groups, businesses, schools, faith communities, and individuals to become co-sponsors in commemorating our community’s 125th birthday. Our history-themed celebration will be filled with music, dancing, and good food. We will be serving tasty appetizers and non-alcoholic beverages along with a great big birthday cake. Wine and beer will be available at a cash bar. This event will be free and all Altadenans are invited. We have a budget and the County is providing use of the Davies Building without charge. But we need sponsors to enhance the event and to make it truly community-wide. To become a major or mini sponsor, you or your group will take responsibility for one or more tasks, or make a cash donation. Sponsors will be included in an illustrated commemorative Altadena 125th Birthday Booklet. We will become part of history! In-kind donations will also be acknowledged in our booklet and/or on our buffet table! Altadena Heritage, (also celebrating its 25th birthday in 2012): event coordination, birthday cake, a great, danceable band, and an historic slide show of the community and the Davies Building. Altadena Historical Society: Historical images, help with coordinating the event, some non-alcoholic libations, and help with staffing the buffet of hors d’oeuvres. Altadena Women’s Network: publicity including communicating and distributing this message around the community. Altadena Rotary: cash bar of beer and wine. Solicit local restaurants (or deli sections of grocery stores like Super King) for appetizer, fruit, or veggie platters and other donations such as paper supplies. Decorate the Davies Auditorium walls with photos, memorabilia from groups, and other exhibits that express our community. Sponsor a street banner over Lake Avenue. Staff the event before, during and after. One-hour shifts will ensure everyone gets to enjoy the celebration. Altadena Heritage, 730 E. Altadena Drive, Altadena, CA 91001.
more specific sponsorship details and ideas. There’s so much to do, and November 3 is less than seven weeks away! 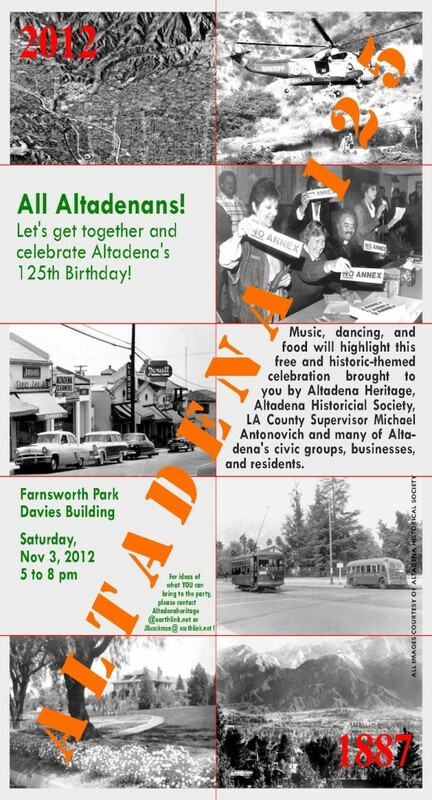 Be part of Altadena’s 125TH Birthday Party. Please consider becoming a sponsor.